Among Pete Stewart’s forest industry predictions for 2019, the 6th prediction highlighted the expansion of Brazil’s forest sector driven in part by increasing exports to global bioenergy and pulp markets that will result in new investment opportunities in Brazil. There are early signs that this expansion is already underway in various forest segments, and the evidence is clear in the export data. Global log trade flows have undergone some changes in the last year due to tariffs and trade tensions—primarily between the US and China—and this dynamic has boosted log exports from Brazil. In 2018, eucalyptus log exports neared 234,000 tons, which is an increase of 122% over 2017 exports. (Figure 1). While chip exports were stable (0.2% in 2018 vs. 2017), there has been a 41% surge in exports over the last 10 years (4% per year). In addition, the volume of chips exported is much higher than the volume of logs, reaching 1.6 million tons in 2018 (Figure 2). 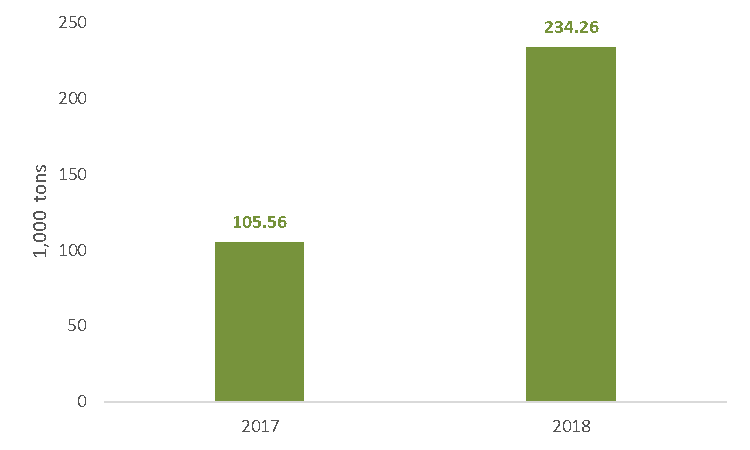 The primary export destination for Brazilian eucalyptus logs in 2018 year was China (Figure 3), which made up nearly 89% of total exports and represents a 112% increase over 2017. 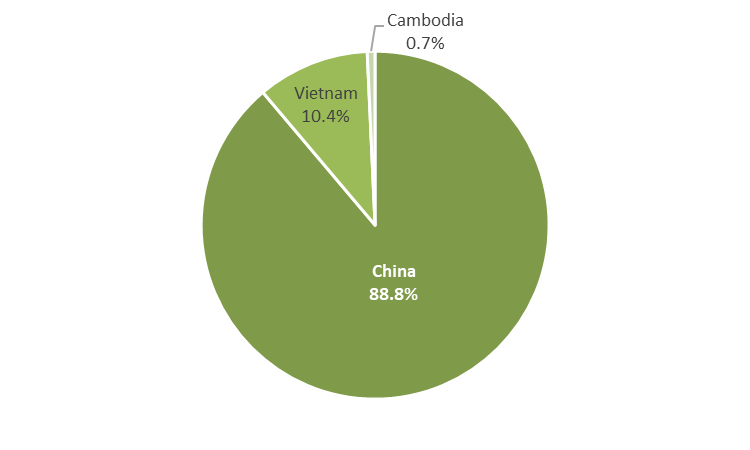 Vietnam also grew its share of eucalyptus log imports more than 300% in 2018. 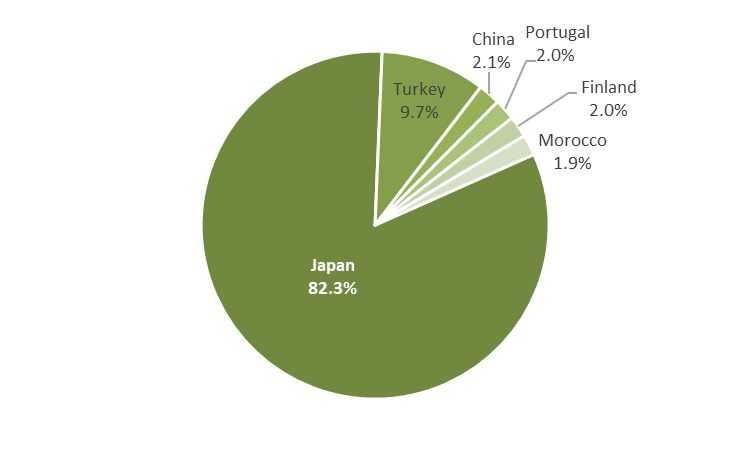 Japan was the primary export destination for chips in 2018 (Figure 4), which increased its share of the total volume of Brazilian chip exports from 76% to 82%. 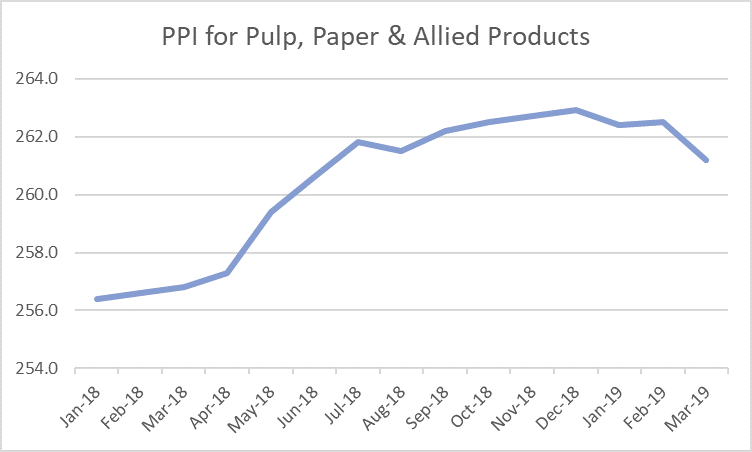 In 2019, we look for a continued increase in eucalyptus log and chip exports. In addition to the destinations that stood out in the data for 2018, Forest2Market do Brasil believes new destinations like Portugal will continue to develop and create additional global demand for eucalyptus fiber from the Brazilian market.